January 21, 1913 Fannie Jackson Coppin, educator and journalist, died. Coppin was born enslaved on October 15, 1837 in Washington, D.C. She gained her freedom at the age of 12 when her aunt, who worked for $6 per month and saved $125, was able to purchase her freedom. In 1860, she enrolled at Oberlin College and was the first African American student to be appointed in the college’s preparatory department. While attending Oberlin, Coppin established an evening school for previously enslaved blacks. Coppin earned her bachelor’s degree in 1865. She began to teach at the Institute for Colored Youth in Philadelphia. 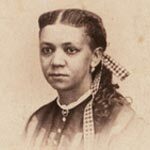 In 1869, Coppin became principal of the institute, making her the first African American woman to receive that title. She served in that position until 1906. In addition to teaching, Coppin founded homes for working and poor women and wrote an influential column in the local newspapers that defended the rights of women and blacks. In 1902, Coppin and her husband went to South Africa and founded the Bethel Institute, a missionary school that emphasized self-help programs. Her book “Reminiscences of School Life, and Hints on Teaching” was published shortly after her death. In 1926, a teacher training school was named the Fannie Jackson Coppin Normal School in her honor. That school is now Coppin State University.